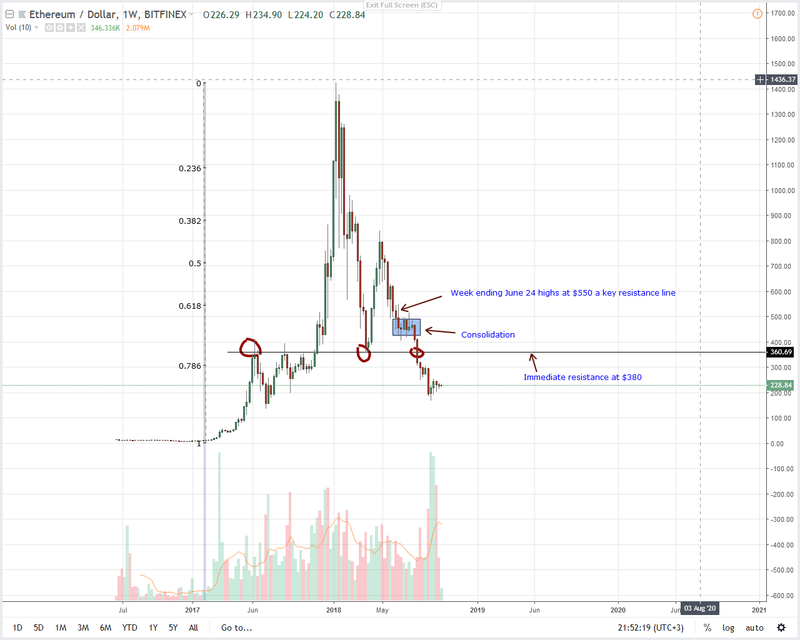 Though liquidity is building, there are limitations for further upsides as ETH consolidates. Unless there are rallies above Sep highs and $250, our previous Ethereum trading plan is valid. For now, we recommend taking a neutral stand until our ETH trade conditions are met. DEXs are not as common as their centralized counterparts. Though exchanges as BitFinex are seeing benefits of spreading out and capturing demands on both ends, it will take time before ETHFinex registers high trading volumes. It’s in this realization that BitFinex are promoting ETHFinex across the three social media platforms and gifting away Ledger Nano s hardware wallets to winners. We’re giving away 2 Ledgers across Twitter, Facebook and Instagram. The contest above will run till Friday, October 12th, 12.00 PM UTC. Anyone is free to participate. This giveaway is not sponsored by Twitter, Ledger or any party besides Ethfinex. In a tweet, they said the decision to market the platform was in no way a sponsored campaign. Instead they made it clear that the parent company BitFinex is behind the goodies. ETHFinex, as the prefix suggest, runs on-top of the Ethereum blockchain. Like BitFinex, users can still trade and benefit from some decentralization benefits as immutability and privacy. Besides, traders can still enjoy the benefits of on-chain trading activities since the DEX now support a couple of coins as TRX and fiat currency pairs as Euro and JPY. In the meantime, Justin Sun claims that Odyssey 3.1 new launch will easily beat both Ethereum and EOS from two important planes: Speed and Cost. Through a tweet he said Tron will be 200 faster than Ethereum and 100 cheaper than EOS. All these three platforms are competing to commandeer the smart contracting world. But, Ethereum is time-tested and valuable second only to Bitcoin. Furthermore, Vitalik and other developers are planning on Ethereum 2.0. According to Vitalik, Ethereum “will take all of these different improvements and put them together and essentially create what we believe is the best possible design for a general purpose blockchain”. With solutions as Shasper from Prysm already in testing there is a lot of potential for Ethereum to crash competitors once fitting scaling solutions are found. Generally, the community is hopeful of gains even in the face of clear opposition. As far as price action is concerned, bears are somehow commandeering and rejecting prospects of higher highs. From the charts it’s clear that there is an overbearing effect of week ending Sep 9 bar which did confirm week ending Aug 12 break below $300. 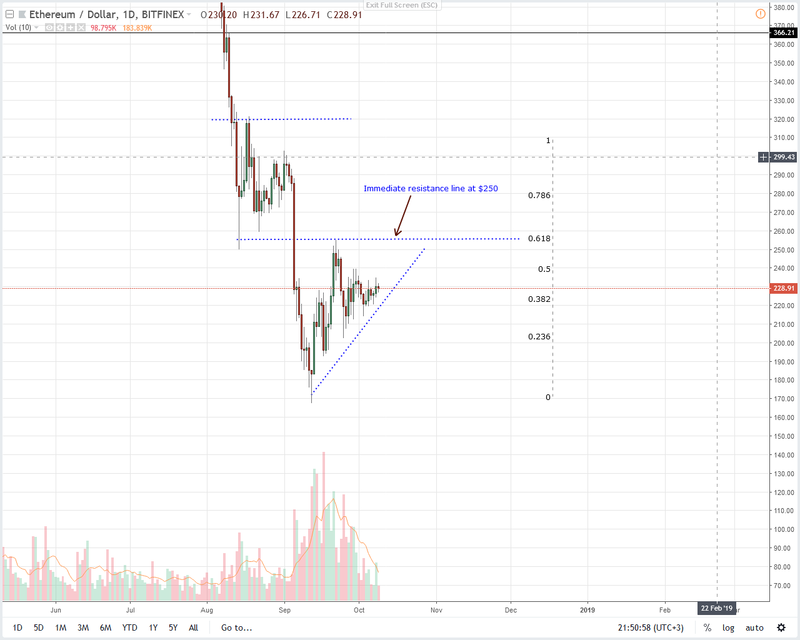 In our analysis, $300 is the main support trend line and before we make bullish calls then we must see strong gains above $250 and $300 as laid out in our last Ethereum price analysis. Therefore, despite volume surges and higher highs in the last three weeks, we maintain a neutral stand. On top of this, we are aware that losses below Sep lows at $160 will most likely invite sellers eyeing $150 and lower in line with the break out pattern of week ending Aug 12. A Fibonacci retracement tool anchoring on Sep high low hints of strong resistance at $250. Coincidentally, that’s the $250 level marking the lower limit of our resistance zone. Aside from the psychological $200, the minor support trend line boosting prices in the last month is the lower barrier. Should there be a break down below this mark in coming days then sellers are likely to have an upper hand. However, rallies above Sep 30 highs and $240 could increase odds of gains above $250 triggering risk-off traders to ramp up on dips in lower time frames.